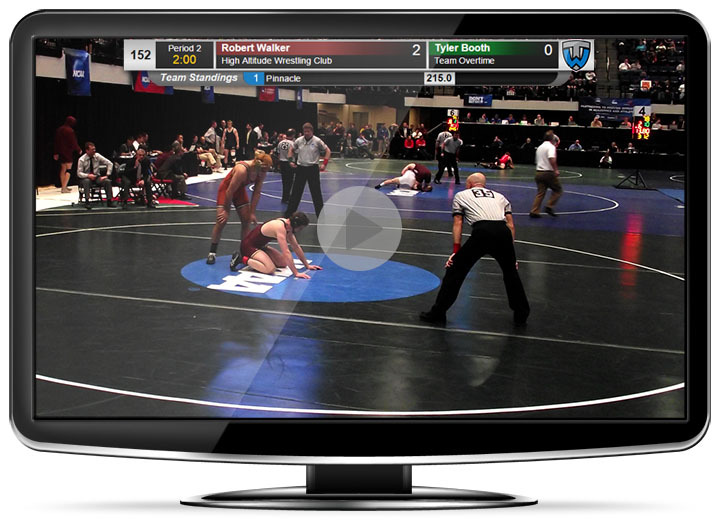 Trackcast is a game-changing live streaming and archived video solution completely integrated into the Trackwrestling platform. It allows users to easily incorporate video overlays with current match and tournament information into their broadcasts creating a professional looking stream that draws people in. The goal of the Trackcast platform is to empower organizations, teams, and event directors with the tools they need to broadcast their events and recognize the revenue streams associated with them. Our mission has been and always will be to create a platform that makes it an easy decision for event directors to use Trackwrestling to help manage their events. This is another great tool in the Trackwrestling tool bag meant to attract people to our platform. In the end, what this allows us to do is create a central repository so the wrestling world can "Track" wrestling. It's a win win for everyone involved, and that is precisely the reason we believe Trackcast is truly a game-changer for the wrestling world. The short answer is it's for anyone and everyone interested in video solutions and the continued advancement of wrestling - organizations, event directors, coaches, streaming companies, entrepreneurs, and fans alike. Each of these groups of people will benefit from using the Trackcast platform. The goal of Trackcast is not to own the video space, but to empower these people with the tools they need to do the things they want to do. So if you are already streaming or archiving video for wrestling events, now you can easily integrate your video solutions with the #1 scoring platform in the country to provide overlays and event information. If you're an entrepreneur, you now have the tools and support from Trackcast to start broadcasting events for people who want that service. If you're an event director you now have the platform to deliver video to the fans that want to see it, gain exposure for your event and the teams/wrestlers participating in it, and generate revenue if you choose to. If you're a coach, you can use the platform to stream and record your duals, grow your fan base, and provide a way for alumni to easily follow their favorite team. If you're an organization you have the ability to take control of your video content. You can purchase the equipment needed and use it over and over throughout the season. Create channel packages that cover anywhere from one stream in a particular event to all streams and archived video for all events, allowing your fans to pick and choose what it is they want to watch. Finally, if you're a fan, you are going to have access to more and more video to follow your favorite wrestlers and teams wherever they may be competing. So if you're not already excited, here is a list of some of the features that should get you there. One LaptopStreaming and scoring can now be done from the same computer increasing efficiency and reducing cost. Connect the computer to the internet, the camera, and possibly a Trackwrestling score clock and run everything off of one (1) laptop. Scoring alerts: interrupts are fired when scoring happens to notify the viewer about what just happened. Current matches: shows what is happening on the other mats the viewer is not currently watching. Upcoming matches: shows the viewer what matches are coming up on all the mats. Recent results: shows the viewer matches that have been recently completed. Team scores: shows the team scores for the event. Announcements: allows the user to enter custom messages they would like to send to fans watching the streams. Current match summary: shows a breakdown of how the points have been scored in the match the viewer is currently watching. Generating Revenue There are two basic ways you can generate revenue using Trackcast. Selling subscriptions to people who want access to your video content and selling advertising/sponsorships around that same content. You can choose either one or a combination of the two to generate revenue for your events. Subscriptions: Subscriptions are sold based on Trackcast channel packages you setup which allow you to mix and match your streams and archived video to create options for fans. For example, you could have a package that is just the finals for your event, another package that is all mats at your event, and another package that includes all mats at all your events. You can mix and match dual meets with tournaments, create a conference package, etc. Sponsorship: Sponsorship can be sold on the around the video content in the following ways. During Match: These sponsor ads display an image on the live streams and archived video during every match in the event. A during the match sponsor can be associated with a mat, weight class, team, state, or individual wrestler. After Match: This sponsor will be displayed after every match and can be an image or video which will show for approximately 15 seconds. These sponsorships can be associated with a mat, weight class, winning team, winning state, or winning wrestler. Archived Preroll: This sponsor can display an image or video and will show for approximately 15 seconds at the beginning of each archived video. An ad can be associated with every match that was recorded during the entire event and the sponsor can be associated with a mat, weight, winning team, winning state, or winning wrestler. Dashboard Mat: A dashboard mat sponsor is associated with a mat in your event. The ad will display on the event dashboard for every match on their mat during the entire event. The ad is clickable and will take viewers to their website. The logo will also be expanded for 15 seconds after every match completes so people know the match is over. Content DeliveryUsers can choose which platform they would like to send their streams to. Ustream: streams can be sent to ustream for free and viewers can watch the streams on this platform for free. Trackcast: allows the user to setup a subscription model by creating one or more channel packages for their events. Trackcast fees are starting at 10% + $2.00 per subscriber and covers credit card processing, bandwidth, and the platform to deliver the video to your viewers. Custom: users may also choose to send their streams to a 3rd party. Recording and ReplayUsers can easily record video and provide video replay. Video ServerUsers can setup a video server for advanced video recording and replay options that allows them to view replay from any computer on the network. With this option they get auto chopping of the videos on a per match basis. You can search and play those videos from within your Trackwrestling event, and you can do all this from any computer on the network (including the matside computer). The best partThe most exciting thing is we are just getting started! Just like Trackwrestling, we have big plans for this tool and will continue to add and improve it as time goes on. Trackwrestling provides the same great support for Trackcast that it does for event management. Contact UsFor any questions or Trackcast inqueries, please submit a ticket. FAQsClick here for a list of FAQs associated with Trackcast. We look forward to working with you on your event management and video streaming needs!